How do I find out if I will need a bone graft to replace a missing tooth with an implant? Help! I can’t eat comfortably with my lower dentures. I am missing a tooth. What is the best way to replace it? Why are dental implants better than bridges or dentures? Can my Gummy Smile be fixed? I am very nervous regarding dental implants. Can I be sedated for these procedures? I have been missing a tooth for many years and was told that I did not have enough bone for implant treatment a few years ago. Are there any new procedures that would allow me to have a dental implant? I have gum recession around a tooth. Can anything be done to fix this problem? I have heard that periodontal (gum) disease is associated with Diabetes. Is this true? I lost a tooth recently, and there is a depression forming in that area. What is it, and what can I do? My denture does not stay in place when I talk and chew. Can I do anything to fix this problem? I was told that I need deep cleaning of my teeth. I’m very anxious about dental treatment; can I be sedated for this procedure? Do I need a referral to get a periodontal or implant exam. Many years ago, I heard that dental implants were risky and experimental. Is this still true? I have not had my teeth cleaned in over ten years. What can I do, and where do I start? That is a great question, best answered when you consult with your dentist or periodontist. With newer techniques and materials, most patients in good general health are suitable candidates for replacing missing or diseased teeth with dental implants. You do have other options for tooth replacement, but dental implants have the added benefits of promoting optimal bone health and functioning independently. We have found that implants are the most functional and aesthetically pleasing solution for replacing missing teeth, so be sure to check with your dentist or periodontist to see if implants are the right choice for you. You need to ask your dentist or periodontist for a CT scan. These scans are the most accurate and comfortable way to see if you have enough bone to support an implant. Most of the time, these scans can be performed right in the office and can offer immediate feedback to help your dental professional determine if you’re a good candidate for an implant. It’s important to determine if you’ve got enough bone structure before you move forward with implant treatment. With implants, advance planning can go a long way toward ensuring predictable results. Unfortunately, we hear that complaint often. Lower dentures can move around and make it difficult to eat normally in comfort. We often recommend dental implants for these patients. In most cases, these patients don’t need any additional bone grafting to prepare them for the procedure, and the implants can be easily connected to a new or existing denture to make sure it doesn’t move while it’s in place. The result is a huge improvement in function and comfort. Be sure to check with your dentist or periodontist to see if implants are the right option for you to help secure your lower dentures. The best option – and the standard of care for modern dentistry – is to replace a missing tooth with a dental implant. An implant is a titanium screw that replaces your missing tooth root. Unlike dentures or bridges that rest on the gums or rely on the surrounding teeth for support, implants actually help preserve the bone in your jaw and the surrounding teeth by stimulating bone growth and functioning independently of other teeth. Implants are strong, durable, and they look like your natural teeth. Be sure to check with your dentist or periodontist to see if dental implants are the best option for you. If you are missing a tooth (or several), ask your dentist or periodontist about implants. Modern dental implants offer several distinct advantages over other tooth replacement options, such as bridges or dentures. Implants help maintain the bone in the area where you’re missing a tooth. Without constant stimulation from teeth or implants, the bone of the jaws will slowly wear away and compromise the health of your remaining teeth. Bridges or dentures depend on other teeth or tissues for support, increasing the chance that you’ll experience problems with those supporting teeth. Since implants function independently, you won’t be compromising the stability of surrounding teeth. Dental implants are truly the most predictable, functional, and aesthetically pleasing tooth replacement option. Yes! Actually, a gummy smile can be corrected in a number of ways depending upon the cause. The most common treatment is to reshape the gum line to allow just the right amount of tooth to be exposed. In effect, we redraw your smile so that it shows more tooth and less gum. The procedure is quick, and you’ll experience minimal recovery time. Best of all, the results are dramatic and immediate. Of course, as with any dental procedure, be sure to consult with your dentist or periodontist to determine if gum contouring is right for you. Yes, conscious I.V. sedation may be used to increase patient comfort during implant procedures. This form of sedation produces amnesia, relaxation and disrupts a patient’s sense of time. This allows for long appointments where multiple procedures may be accomplished without patient fatigue. In many instances, oral medications may be prescribed to be taken the night before and the morning of the procedure to decrease pre-operative apprehension. With the development of more advanced techniques, many patients who were previously told they didn’t have enough bone for an implant are now great candidates for the treatment. When someone loses a tooth, the bone beneath that open space begins to shrink and dissolve, since there is no tooth there to provide the stimulation that the bone needs to remain strong and healthy. With newer techniques, we can now actually graft bone, from the patient or from another source, to regenerate the portion that has dissolved away. Once the bone is healed, we can then place the implant, which will provide the stimulation that’s needed to maintain the bone. However, as with any procedure, you’ll need to schedule a thorough exam with your dentist or periodontist to make sure that this course of treatment is right for you. Absolutely. Gum recession, when the gum pulls away from your tooth and exposes more of the tooth structure, is caused by a number of issues: thin gums, improper brushing, gum disease, or even grinding your teeth. Once we’ve addressed the cause of the recession, we can repair the damage by grafting additional tissue onto your gums to thicken them and even provide more coverage of the tooth root. Sometimes the additional tissue may come from you, the patient, or from another source. Your periodontist will recommend the best tissue source for your particular situation. Best of all, once corrected, patients seldom if ever have problems with gum recession again. I’m afraid so. Diabetes can affect many parts of your body, including your mouth and eyes. Patients with untreated or poorly controlled Diabetes are actually four times more likely to have periodontal disease than their non-diabetic counterparts. Also, diabetic patients often heal more slowly following tooth extractions or oral surgical procedures. However, studies now show that patients with well controlled Diabetes respond as well to periodontal treatment as any other patient. Since Diabetes may be inherited, be sure to discuss your family health history with your physician, dentist, and periodontist, to ensure that you enjoy great oral health and a lifetime of healthy smiles. Well, that depression in your gum is actually caused by bone loss. Your teeth provide stimulation that the bones in your jaws need to remain strong, healthy, and dense. When you lose a tooth, and it’s not replaced with an implant, your jawbone actually begins to shrink and dissolve, causing a depression in your bone and gum. For patients who’ve experienced such bone loss, we recommend grafting bone into that area to replace what’s been lost, then placing a dental implant where the tooth should be. The implant will act just like a natural tooth and provide the stimulation that bone needs to stay strong. 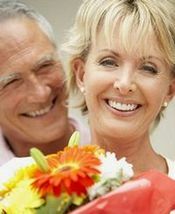 Dental implants are really the treatment of choice for replacing a missing tooth, even if the tooth was lost years ago. We hear this complaint often, especially from patients who’ve been wearing a denture for several years. Since a denture doesn’t provide the stimulation that your natural teeth would for the bone in your jaw to remain strong and dense, you’ll gradually lose the bone structure in your jaw over time, and your dentures won’t fit as well as they did when you first began wearing them. The best long-term solution is to place dental implants to stabilize a loose denture, or even fabricate teeth that will remain in your mouth permanently. Once you and your periodontist decide whether removable or fixed teeth are the best choice, you can begin treatment knowing that your dental implants will provide a lasting solution to your problem. Yes! Many patients feel anxious or unsettled about dental treatment, so you are definitely not alone. Conscious IV sedation may be used to make you more comfortable during deep cleaning, making you feel very relaxed and groggy. Since IV sedation also produces amnesia and disrupts your sense of time, you can go ahead and get the entire deep cleaning completed in one appointment without feeling fatigued. Your periodontist may also prescribe an oral medication for you to take both the night before and the morning of your procedure. This will help relieve your apprehension regarding the procedure, and increase the effectiveness of the IV sedation. No, you don’t need a referral to see a periodontist. Although some patients are referred by their general dentist, many of our patients have not seen a dentist on a regular basis in many years. Some of our most appreciative patients considered themselves to be dental disasters and didn’t know where to start restoring their oral health! Many times, anxiety or fear associated with dental treatment is blamed for neglect and not seeking dental care. A periodontist is qualified to diagnose and treat many of the dental problems that may occur when patients avoid dental treatment, and to make referrals to other dental professionals when necessary. Not at all. Actually, dental implants are now considered to be the treatment of choice for replacing missing or diseased teeth. Ten year success rates of over 97% have been reported. Unlike bridges or partials, implants replace missing teeth without affecting nearby healthy teeth. Also, implants function in many ways just like your natural teeth, so the bones in your jaw receive the stimulation that they need to remain strong and healthy. Dental implants are truly the most predictable, functional, and aesthetically pleasing tooth replacement option. A periodontist is a great resource to start resuming your dental treatment. Since you may be experiencing plaque build-up around your teeth and under your gums, diseased teeth, and the like, a periodontist, who specializes in the health of your gums, teeth, and surrounding tissues, can offer you the highly skilled care you may need to get your oral health back on track. If fear or anxiety has prevented you from seeing your dentist on a regular basis, don’t worry. Many dental professionals can administer conscious I. V. sedation, which will produce amnesia, make you relaxed, and disrupt your sense of time, so that multiple procedures can be accomplished in one visit without tiring you. Also, oral medication can be prescribed, to be taken the night before and the morning of the procedure, to decrease any apprehension you may feel. In any event, be sure to make an appointment soon to restore and maintain great oral health.